If there was only one dietary change I would encourage everyone to make it would absolutely be to stop consuming sugar! Loved by all ages and races the world over, sugar is the most widely consumed and addictive drug on the planet. I’m not being dramatic – it is a well known fact! However, just like typical addicts no one is keen to acknowledge that they have a problem, or they’re full of excuses because it’s too hard to give up. Set aside some time to watch this documentary if you’re interested in learning more. Very similar to cocaine, white refined sugar is a pure chemical extracted from plant sources that has absolutely NO nutrients. Even worse is high fructose corn syrup (HFCS) made from highly processing corn – pure evil. These forms of sugar contain high levels of fructose that, just like illicit drugs, trigger feel-good chemicals in our brain. However, while we’re tripping on this short lived high that all is well in the world, our liver is literally drowning in fructose and has no immediate way of telling us to stop. Instead, over time it becomes fatty and unable to do its job well and as a result our whole system suffers. Robbed by sugar of our essential minerals, vitamins and enzymes, we become: anxious, moody, depressed, weak, easily ill, prone to weight-gain, rashy and totally dependent on finding our next sugar fix. Now this is by no means doom and gloom. There are SO many delicious things you can eat that won’t screw everything up like the bad sugars do. Learn from the lists below just what is best to consume, moderate and avoid. 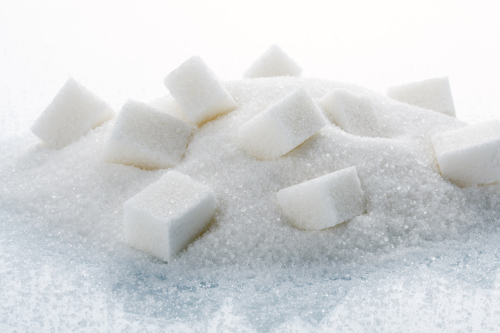 Basically you want to eat sugar in its whole natural form…what a surprise huh? Wanting something sweet, go for the following: Freshly pressed vegetable juices, roasted root vegetables, baking made with whole food ingredients and sweetened with ripe fruit or veg (carrot, beets, squash, courgette are great! ), raw dairy products, dark chocolate (85%+), cereals made from soaked and sprouted nuts, seeds and coconut. TERRIBLE = Artificial Sweeteners aspartame, sucralose, saccharin etc. Avoid foods like: carbonated drinks (including their diet counterparts), pasteurized bottle fruit juices, milk chocolate, granola bars, sugary breakfast cereals, sweetened fruit yoghurts – the list could go on! I think most people know the obvious sugary foods to avoid, but remember that simple carbs also turn straight to sugar (then fat) in your system too – so white flour and refined grains should also be included in this nasty list. 1) Fat – satisfies your hunger, helps digest protein, helps control sugar cravings, essential to virtually every cell in your body. Go for coconut oil, organic grass-fed butter, ghee, soaked nuts and seeds, olive oil, avocado and animal fats. 2) Protein – satisfies your hunger, provides the building blocks for everything in your body, sustains energy levels. Go for organic grass fed meats, wild fish, organic eggs, raw dairy, soaked nuts, seeds and coconut products. 3) Carbs – give instant energy but can be short lasting in comparison to fat and protein. Go for vegetables – root veg such as butternut squash, carrots, courgettes, beetroot and sweet potato are great fillers. Measure = 120 calories of fructose = 40 calories are stored as fat.